After graduating from Sydney Boys’ High, Roderic completed his dental degree from the University of Sydney. 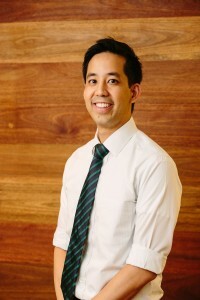 Roderic gained invaluable experience working at the Sydney Dental Hospital and then in general practice, before completing specialist training in Prosthodontics, also at the University of Sydney. During his postgraduate studies, Roderic received extensive training in the restoration of broken down or missing teeth using crowns, bridges, veneers, dentures or dental implants. In 2009, Roderic won the Poster Competition, at the biennial meeting of the International College of Prosthodontists in Cape Town, for his research on zirconia ceramic. Roderic is a member of the Royal Australasian College of Dental Surgeons, International College of Prosthodontists, International Team for Implantology and the Australian Dental Association. He also attends numerous lectures and conferences, both here and abroad, to stay up to date with the latest advances in dentistry. Roderic is passionate about continuing education and is involved in teaching Prosthodontics to final year dental students at the University of Sydney. Outside of work, Roderic enjoys playing tennis, soccer, going swimming or to the gym, reading and spending time with friends and family, especially with his wife and three young daughters.